Left Hand | Beer Apprentice - Craft Beer News, Reviews, Interviews and Info. Hello everyone. 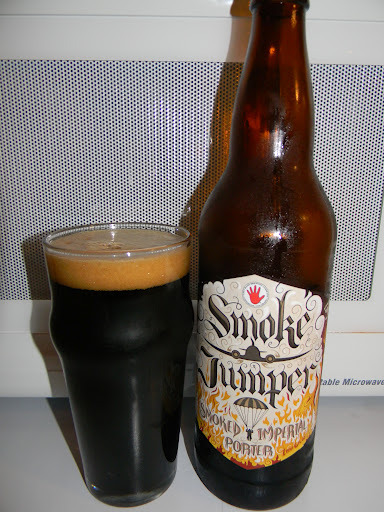 For today’s craft beer review I’m going to be trying the Smokejumper produced by the Left Hand Brewing Company located in Longmont, Colorado. It’s been forever since I last had a Left Hand beer and I’ve heard a great deal about this one, so I figured I would give it a go. From the website, lefthandbrewing.com, we find this bit of information about the Smokejumper. Here in Colorado we are blessed with abundant natural beauty. Smokejumpers are those fearless wildland firefighters who specialize in parachuting into the wilderness so that we can continue to enjoy it. Smokejumper Imperial Porter is a tribute to them – a twenty-one degree plato porter made with barley malt hand- smoked by our brewers. Roasty brown in color, the long lingering smokiness wraps around flavors of molasses, toasted malt and an earthy hoppiness. Here’s to smoke in your glass, not in the woods. Smokejumper is the official beer of The National Smokejumper Association. http://www.smokejumpers.com/. This brew comes in a 22 oz. bottle and it has an ABV of 8.8%. It poured a very nice dark brown to black color. Just a smidgen of ruby was seen around the bottom of the glass. It had a tan colored head that was small, smooth and creamy. The retention time was average and the lacing was thin and seemed to fall back into the liquid fairly quickly. The smell released a nice dose of smoke. Hints of bacon grease, bacon fat and baked ham. A touch of woodiness was noticed along with a relish of dark chocolate deep within aroma. Some earthy hops seemed to play a supporting role from the very beginning and stayed consistent until the end. This is a real nice smelling brew right here. The taste was more of the same. A good bit of smoke and wood. Some roasted grains with a nice bacon and ham flavoring. Some tasty chocolate that began to be more noticeable as the brew warmed. I also got a taste of dried black pepper beef jerky. Very nice. The earthy hops were noticed again and they helped to bring about a touch of bitterness that was needed actually. As I continued, I don’t know if I just happened to be getting used to the beer or not, but the smokiness started to subside and lose it’s power. Hmm. Could’ve just been me I guess. The mouthfeel was medium to full bodied. Very smooth and chewy with a touch of warmth from the alcohol. The carbonation seemed to be low to medium. A lot of flavor was left behind after each sip however. Overall, I thought the Left Hand Smokejumper was a nice and solid “smoked” beer. I, personally, don’t think it’s quite on the level of the Schlenkerla products, but if you were looking for a worthy substitute, this beer could be it. It’s definitely worth a try. I doubt that I would ever turn it down if it were offered to be honest. Like all smoked beers though, the drinkability factor is somewhat low for me. I like about one bottle per sitting. This is not a style that I can make a night of that’s for sure, but on occasion I just get a craving for one. These type of brews are best suited for the cooler weather in my opinion, but I had no problem handling this on the relatively warm night in which I tried it. Be sure to let me know how you think this beer compares to other smoked beers out there if you get the opportunity to try it. I would love to hear your opinion. Thanks for continuing to read the reviews guys. I really appreciate it. Today, I thought I would share another beer from the Left Hand Brewing Company located in Longmont, Colorado. This brew is their version of a Milk Stout called quite simply, Left Hand Milk Stout. Simple enough, huh? I found this little description on the website, lefthandbrewing.com. You guys know that I do love Stouts, so let’s taste it. This beer is packaged in a 12 oz. bottle and has an ABV of 5.2%. Once in the nonic glass, the beer appeared a very dark black color with the common ruby highlights around the edges and bottom. The ruby really stands out when held toward the light, and I can tell that it’s clear too. With an easy pour, a pretty decent looking, cream colored head was formed that had nice girth, retention and some approved lacing. The cap was creamy and smooth. With the aroma, I found a very pleasant, toasted chocolate note along with a yummy marshmallow cream fragrance. It totally reminded me of “S’more’s.” I loved those things when I was a kid at camp outs!!! To finish off the bouquet, I found a nominal amount of roasted coffee. Generally, the smell was sweet, balanced honorably and not overly complicated. As I took the first sip, my taste buds welcomed a flavor that was very reminiscent of chocolate milk. Again, some of that pleasant marshmallow cream was enjoyed. The milk chocolate and cream sweetness balances some touches of roasted coffee bean fairly well. Small tinges of bitterness glide across the sides of the tongue for some added complexity and balance. The mouthfeel was a small disappointment though. It was medium to thin and even somewhat watery. I was hoping for something a bit thicker, dryer and chewy. I love that type of mouthfeel for my Stouts. It was still smooth, creamy and easy going however. Delicate coffee touches were left on the palate for a moment while I waited to take another sip. Not too bad, just a little thin. This is a pretty good Stout really. A superb session brew that could double as a decent introductory Stout for someone wanting to experiment with the style. It’s very easy to drink and doesn’t overwhelm the palate with flavor, but gives you enough to explore the characteristics of a good Milk Stout. I sampled this brew back in January on a cold, snowy evening and it seemed to fit the mood to a “T.” Overall, I liked it and would recommend that you pick it up, contemplate and enjoy. Have you guys had the Left Hand Milk Stout? What did you think of it? Please, let me know in the comments. Thanks for reading.